High-level stickhandling is a must in today’s game. With tighter defensive systems and less time and space on the ice, a good, quick set of hands can create opportunities for you out of thin air. Adept puck handling skills will give you more success with breakaways, one-on-ones, avoiding checks, and changing the angles on goalies before you shoot. If you want to know how important it is, look at how many people follow YouTube star Pavel Barber – the modern day guru of stickhandling drills. About 150,000 last time we checked! 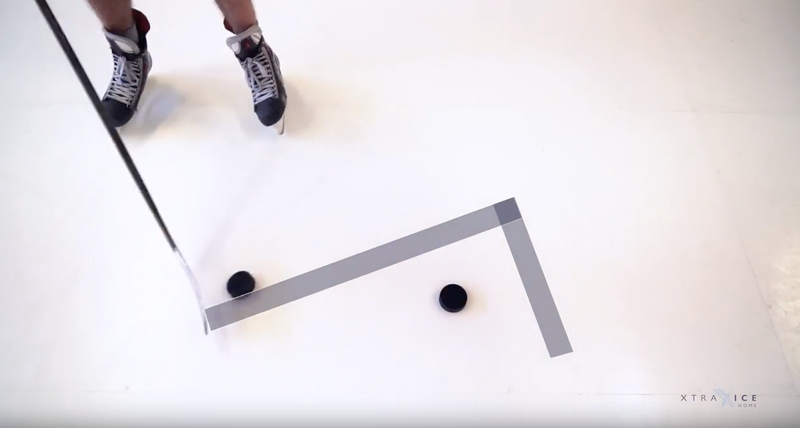 We’ve started this series with 4 simple drills that you can do both on and off ice, though we used a small area of Xtraice Home synthetic ice. We recommend doing these drills on skates to simulate game conditions as much as possible. Keep your head up and try not to look at the puck. The toe drag is a must have tool. In this drill, we’ll use two patterns – the L and the triangle – around a single puck to warm up the hands and wrists. Start with the L pattern, simply toe-dragging once around the puck and returning to your original position. Then, repeat using a backhand toe-drag. Once you start to flow, add the triangle in, mixing and matching the two patterns as well as backhand and forehand toe-drags. Do 4 sets, each time until exhaustion. Add a second puck so that you now have two side by side but with enough space to make you extend your arms a bit. Now, you’ll do figure 8 patterns around the two pucks, again mixing backhand and forehand touches. Make sure to rest for 15-20 seconds between each set and remember that it’s important to change directions each set so that you work the full range of movements. You’ll want to do these at a speed that allows you to have good control of the the puck but always challenge yourself to get up to game speed. In this drill you’ll do the same as in Drill 2 but with the puck in a vertical formation. The objective is to make your hands work through a wide variety of movements so that you can stickhandle in any space available on the ice. Starting with the puck at your side in a passing or shooting position, you’ll simply fake the pass and backhand toe-drag across your body. This move is increasingly common since the fake buys you a little space and the backhand toe-drag ensures the puck isn’t exposed to a forechecker’s stick.